The World Forum for Democracy will discuss youth participation to influence democracy this year under the theme ''From participation to influence: can youth revitalise democracy?''. 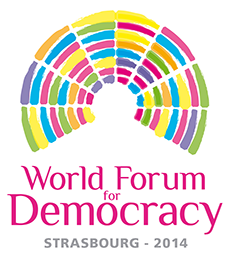 The Forum is taking place in Strasbourg, France, from 3-5 November 2014. Participation is free of charge and registration will open in September this year. So stay tuned to get last updates! Democracy is played out in the political institutions of society, but also in the multiple arenas where people come together: formal and informal education, the work place, sport, culture, civil society and increasingly, in social media via the Internet. Democracy requires firm and unshakeable foundations, but must be transmitted and renewed from generation to generation. Today, we witness among young people a rising abstention from electoral participation and party politics, distrust in mainstream media, and sometimes violent rejection of traditional embodiments of political power. In transition democracies, young people are at the forefront of movements of popular rejection of corruption and electoral fraud, but are conversely marginalised in the process of democratic consolidation. In times of economic crisis, young people are increasingly faced with exclusionary barriers in the "everyday arenas". How to increase any democratic participation of youth through the labour market when employment opportunities decrease? Is education a real promise for prosperity and security, and is it a good vehicle for inclusion that extremely qualified generations now have less guarantee of access to the labour market, leading some to speak of a "lost generation"? There is a disparity between young people's aspirations on the one hand and forms of engagement and the limited opportunities for influence on the other hand. There is also a disparity between the ideals of young people – such as social justice and equality – and the priorities of democratic decision-making. There is a mismatch between the long perspective youth desires to influence in order to shape their future and a pressure to focus on short-term obligations. Nonetheless, potential for youth influence and participation in democracy exists. Many young people are engaged at community and grassroots levels and express strong civic ideals and commitment. A wide range of formal participation opportunities for youth exists – elected student representatives, local youth councils, youth parliaments, youth branches of political parties etc, but their impact is relatively weak. It is crucial to enhance youth democratic involvement, not only in terms of participation (quantity) but also in terms of influence (quality). It would be important to identify cases where such structures are genuine vectors of democratic participation rather than an alibi, and to explore the conditions which make them successful. New ways of socialising and organising are being forged and pioneered by the young via on-line media and social networks, from a perspective which may challenge established models of democratic governance. Moreover, there are a number of successful political figures deeply engaged in the existing structures of representative democracy who try to improve the system "from within". All these perspectives should be explored in order for societies to mobilise the potential of youth as actors of positive change. The SWFD 2014 will engage with young people and with decision-makers and opinion-formers in a reflection on these patterns of exclusion and involvement and will explore new ways of engaging young people in re-visioning the democratic arenas of today. The World Forum for Democracy is an annual gathering of leaders, opinion-makers, civil society activists, representatives of business, academia, media and professional groups to debate key challenges for democracies worldwide. The insights gathered during the World Forum meetings inform the work of the Council of Europe and its numerous partners in the field of democracy and democratic governance.